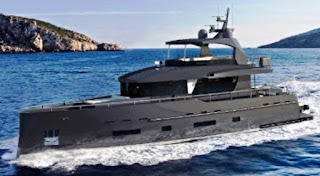 Bering 70 Tempest is project which is part of the US company Coastal series featuring a more low profile design explorer yachts. The 70 Tempest differentiates itself from the standard 70 also for being lighter build of aluminium instead of the steel of the Coastal. This construction change reduces weight by 22 tons to 40 tons, with a speed increase of nine knots, up to 22 knots with standard twin Cummins 600hp engines. The Bering 70 Tempest will offer two interior layout, one for two large guest cabins, or an option for a three cabin three head version. A single berth crew cabin is offered in the three cabin arrangement. Living, with galley and saloon is located on the main deck.